Mash the bananas with a fork in a bowl, add the sugar, salt, and cinnamon. Add the milk and then the flour bit by bit, and towards the end also the baking powder. If you use an electric whisk it comes together more easily. Lastly add the chopped ginger and hagelslag/sprinkles. To see if the batter works with the amounts you used, start with frying one pancake on medium heat. When the surface has risen and is bubbly, try to flip it. If it works it works, I guess… Go by feel! 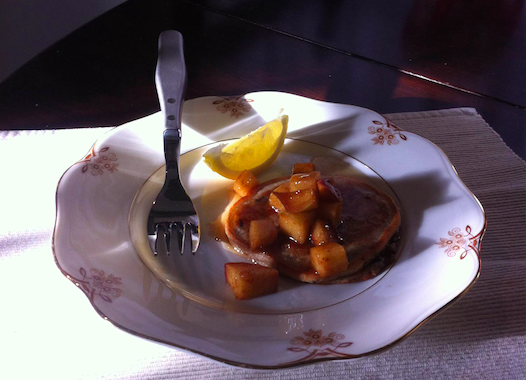 We served them with lemon juice and sugar, and fried diced apples with cinnamon and maple syrup.